Isabelle seemed to be always searching for fame. She tried with her violin. She tried with ice skating. She knew inside her that she was meant for something bigger. In her early twenties she changed everything she could about herself to start from scratch. She got a new nose, new lips, new chin, new name. She got an agent for acting and then received an offer for a huge job, to be the model for Oliviero Toscani's No-Anorexia campaign. She accepted and got swiftly thrown into the media ring, a place where she knew (in a sense) how to use her power, which was her anorexia. It was exciting for her. After the campaign came out she was in high demand on all the television networks, and was flown to multiple countries to be on talk shows and news programs. In some weird way, she was living out her wildest dreams, but through something that made her sick. She told everyone she was getting better, that she gained weight since the campaign but the reality is, her illness became her job. Something she couldn't admit to herself and many wouldn't admit in front of her. Was my film perpetuating the problem? I decided, since I was not acting like the news were acting, and was genuinely interested beyond her illness, that I was not. But now, in Germany my film has been marketed exactly as the media treated her before: with no respect for the person and exploiting the salacious image she became. I have to believe that the light inside the film, a film I made with extreme care and thought, is stronger than the bad. Maybe the people that are called in to see the film in that manner are the ones that need to experience humanization the most. The most asked question when I was making this film was “why?”. It took finishing the film to really understand my reasoning for why, and for me the reasoning was that Isabelle was like a mirror. A mirror that took another path. I was fascinated with how Isabelle dealt with her pain. It was so visceral. It was there for everyone to see. She was hurting and she told everyone about it. It showed. A bizarre thing happens when people tell us about their pain. I think more often than not it causes retreat. Sadly, not knowing how to help leads to abandonment. There is a fine line of experiencing your pain and victimhood. I unfortunately think that Isabelle couldn’t find her way past the later. But she was up against a lot. And because of the way she felt her pain, that turned her into an object once she participated in the NO-Anorexia campaign. But in the end, Isabelle was just a human. There is no need to abandon that. So as I was filming, I stayed put. I tried to remain loyal even when she was an extremely challenging human to be around. I genuinely hoped that Isabelle would pull out of it. She was strong enough in will, she could of. But she didn’t make it. I identified with Isabelle’s pain, and my way of helping was staying and distilling her story. And somehow, by distilling her story, I helped myself. So thank you for that dear Isabelle. Growing up, Isabelle's house was always full of dolls, stuffed animals and real animals. The sheer volume of numerous animals in the photos are striking, while these stuffed bunny rabbits remain part of the story up until Christian brought them out for me the last time I visited him in the South of France. If only those stuffed bunny rabbits could speak, I'd be so interested in their side of the story. After Isabelle passed away, I became close with her father, Christian Caro. When I came to Paris, he would bring me things he found hoping they could better explain Isabelle's childhood. It was kind of like evidence to prove what he was saying was true, though I believe, especially with family, we all have our own version of truth. One day he brought me Isabelle's journal, written when she was eleven years old. She wrote the entire thing like a novel, full of character descriptions with pages of diaglogue between her and her mother and father. It was almost as if she knew from a young age who she would become. She named this journal, "The Misadventure of Melody". Isabelle spent her first few years of life around music with Christian, the father that raised her who was a sound technician, and the man she says was her biological father, French pop star, Danyel Gérard. In fact, Isabelle's given name is Melody, named after Gérard's hit from the 70's, "Mélodie, Mélodie." 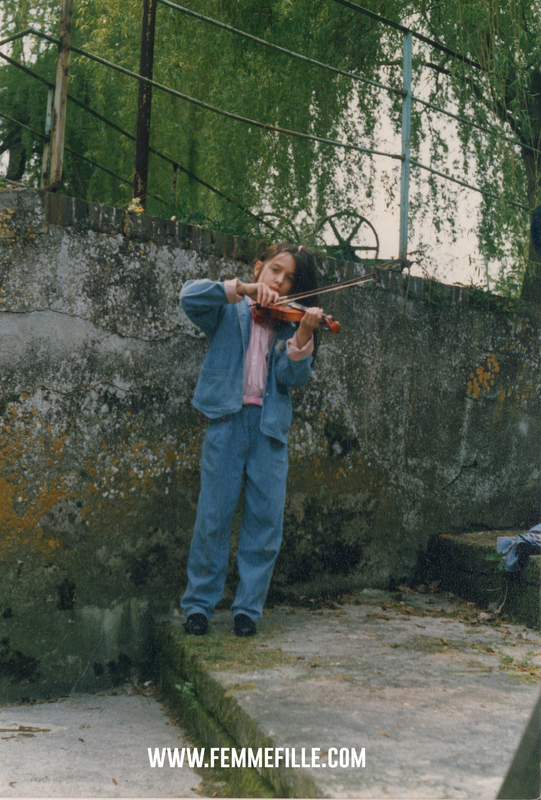 When she was very young her parents gave her a violin, which she played until she completed conservatory in her teens. She appeared on radio stations and even released a record titled "Mon Violon" under her first name change, Claire Mélody. We detail this fascinating part of Isabelle's life in the film! Please rent on iTunes June 30th. For Isabelle's first picture, I will release my favorite picture of her that did not make it into the film. Isabelle loved being by the sea. She talked about it often. When she was little, her and her family used to vacation with Danyel Gerard, a musician that Isabelle claims to be her biological father. This photo was taken on one of those trips. So lovely and so French, I love this picture. In eight days, the film that I made, with the help of many, including the wild universe that lead me on a journey I couldn’t make up, will be released on iTunes. My intention with this film was to understand a woman I knew, Isabelle Caro, who was stuck inside herself as a little girl, desperately wanting to be understood. This film is in part about the power of an image, so I will be doing 8 days of releasing images that were powerful to me as I created this film. Also an image every day of Isabelle. Her life was made up of many fascinating faces, not just the images of her ill that are constantly used by the media when talking about her. I understand that it is how she became famous, but that is not the only part of her. My google alert for Isabelle is constantly alarming me of people trying to find pictures of Isabelle from before she was sick. Well, we have many with rich pieces of her story that accompanies each image, which we will release here.